In this month's newsletter you have a chance to win 1 of 5 amazing HP Slate 7" tablets and we invite you to join us at HP's upcoming technology event. Now you can get inkjet quality prints at up to twice the speed and half the printing cost of laser. 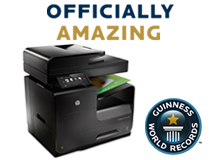 The secret is HP's new PageWide inkjet technology and it's set to give traditional lasers some stiff competition. HP are hosting a "Technology at Work 2013" event and we invite you to visit and check out the latest technology for your business.